Ever Wondered the need for a USB stick to boot from and install the Operating system with easy, without worrying about the problems of Optical drives/CD Roms/DVD Rom drives. As we all have faced some problem with DVDs which develop scratches and makes difficult for the drives to read the data on them resulting in missing files during installation? Or a slow installation with a DVD drive? The advantage of USB stick are many a very compact size, large amount of data can be stored there are good large USB sticks are available upto 128GB size we can easily find a reasonable 32GB USB stick for a very cheap price. Here you may wish to find / buy some USB Drives from Amazon. So lets begin with the simple method of creating a bootable USB Disk on Windows 7 Operating System. 2. 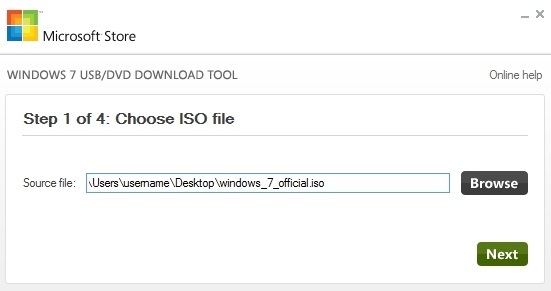 Go the downloaded ISO folder and click browser ISO file. 3. Click on Next button. 4. Here you will be asked whether you want to save this file to a USB drive or a DVD, in our case Select USB device. 5. Connect the USB/Pen Drive to the USB with a capacity of at least 4GB plus. 6. From the Drop Down Menu Select the USB Drive and Start the process of copying. I tested WinKeyFinder so I could verify that my Windows 7 Home Premium 64 bit edition product key matched the tag on my p.c. it did not. But the product ID did match.OS platform states Win32NT under system information , it is not. So what’s the problem? Hi Thank you for writing, can you please tell me what version of Winkeyfinder you tried on? Please check Winkeyfinder 2.0 that is the latest version and many bugs have been fixed.